The timing and magnitude of phytoplankton blooms in subarctic ecosystems often strongly influence the amount of energy that is transferred through subsequent trophic pathways. 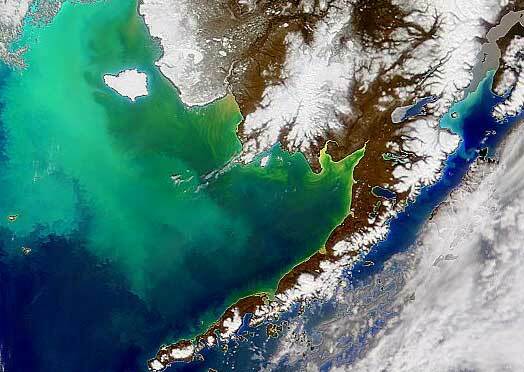 In the eastern Bering Sea, spring bloom timing has been linked to ice retreat timing and production of zooplankton and fish. A large part of the eastern Bering Sea shelf ( ~ 500 km wide) is ice-covered during winter and spring. Four oceanographic moorings have been deployed along the 70-m depth contour of the eastern Bering Sea shelf with the southern location occupied annually since 1995, the two northern locations since 2004, and the remaining location since 2001. Chlorophyll a fluorescence data from the four moorings provide 37 realizations of a spring bloom and 33 realizations of a fall bloom. We found that in the eastern Bering Sea, if ice was present after mid-March, spring bloom timing was related to ice retreat timing (p < 0.001, df = 1, 24); if ice was absent or retreated before mid-March, a spring bloom usually occurred in May or early June (average day 148, SE = 3.5, n = 11). A fall bloom also commonly occurred, usually in late September (average day 274, SE = 4.2, n = 33), and its timing was not significantly related to the timing of storms (p = 0.88, df = 1, 27) or fall water column overturn (p = 0.49, df = 1, 27). The magnitudes of the spring and fall blooms were correlated (p= 0.011, df = 28). The interval between the spring and fall blooms varied between 4 to 6 months depending on year and location. We present a hypothesis to explain how the large crustacean zooplankton taxa Calanus spp. likely respond to variation in the interval between blooms (spring to fall and fall to spring).